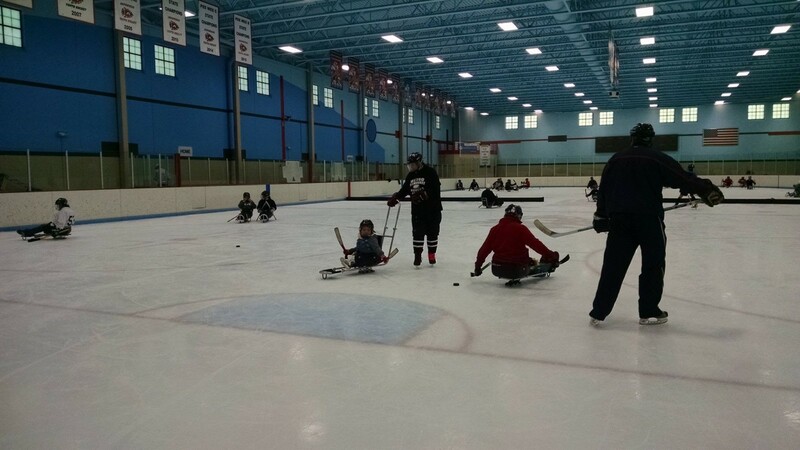 Last weekend, Namine got to try something new: sled hockey. Namine does wheelchair basketball through Wisconsin Adaptive Sports. It was through them that we learned of a bunch of upcoming events, including softball (which Namine loved doing last year with Miracle League) and sled hockey. Namine has a “bucket list” (although much less morbid) of things she wants to do — or at least try. On the list is rock climbing*, ice skating, and skateboarding. (On the way home from my office is a small skate park, and every time we pass it she asks me if she can learn to skate.) So when she learned of WASA’s Learn To Skate event, well, let’s just say that “excited” is not a sufficient word to describe her enthusiasm. *Yes, Namine has already tried rock climbing. Unfortunately, the harness hurt her legs and hips, and so it was not an ideal experience. Namine insists that she still wants to try it again, on the condition that we find a harness that fits her properly. When we arrived at the ice rink, Namine got fitted for a helmet. We had already bundled her up in a hoodie, extra leggings, and mittens. They offered her some gloves they had on hand (sorry not sorry), but she preferred to keep the mittens. Since this was her first time, she opted for a sled that had handles, so someone could help push her. The whole event was two hours long, and Namine stayed out there the entire time. Even with someone pushing her, she still tipped a couple time, but that didn’t discourage her. She got the hang of using the two short hockey sticks to push herself, but she was more interested in thwacking a puck whenever she got near. As she continued to skate around, her initial excitement eventually gave way to something calmer (but still very enthusiastic), and she learned how to pass the puck between her two hockey sticks underneath her sled. When it was eventually time to come in, she didn’t want to. She saw that everyone else was coming in too, so she reluctantly agreed. Afterward, she described the whole experience as “a dream come true.” We will definitely be doing this again.